The Lewmar 90 mm Toggle Head Synchro Block is engineered for speed, efficiency and superior handling. It uses a combination of scientifically optimised block geometry, a Free-Spin bearing and self-aligning head to reduce friction and increase efficiency by up to 40% over budget blocks on mainsheet systems. 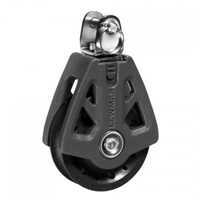 The toggle head of the halyard blocks is designed to fit on the studs commonly found at mast bases.